"This is not totally homemade, however, I haven't ever tasted better!" Preheat oven to 200 Degrees F (105 Degrees C). Saute the onion in butter. Combine the clam chowder, minced clams, cream of potato soup and half and half in a large roasting pan. Bake for 4 hours. This recipe is great. Living in Maine it is hard to please these experts, this recipe is impressive! 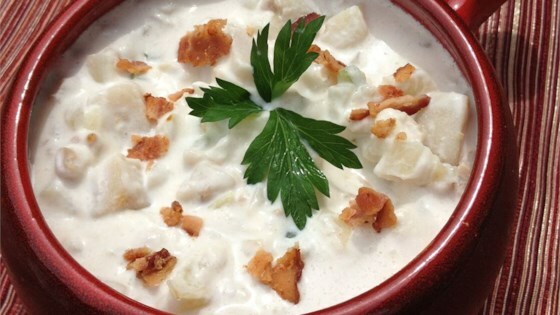 I made this chowder last Christmas Eve and everyone thought I had "slaved all afternoon" making it! It drew raves. I just made this recipe. It is excellent!!! Very easy to fix. I added some bacon to the sauteed onion for a little bite of flavor. I will definetly make this again.